The Employee Development & Feedback System (EDFS) is an online platform supporting the new educator performance evaluation system in Boston. The purpose of the EDFS is to serve as a vehicle for educators and administrators to view and record every step of the evaluation process and facilitate communication between educator and evaluator about opportunities for development. By housing performance and development information in one place, the district can facilitate more timely feedback and easier access to resources that educators will be able to access consistently throughout and beyond the evaluation cycle. 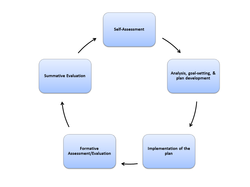 Self-assessment and goal proposal - Educators must complete their self-assessment of and proposal for at least one professional practice and one student learning goal (team or individual) in the EDFS by October 1. Following the submission of proposed goals, evaluators will approve or return goals to the educator. Collection of Artifacts and Observations - Educators and evaluators both are responsible for the submission of artifacts of practice to the online system. These artifacts should be robust representations of educators’ proficiency across the rubric. Evaluators are responsible for inputting evidence from observation to the system. Feedback on an observation should be returned to the teacher in five days. The EDFS is not intended to replace the need and value of conversations between evaluators, individuals, and teams of teachers. As a result, goal-setting, post-observation, and post-evaluations conversations are still essential to the development of educators, even though the system will facilitate electronic delivery of feedback.